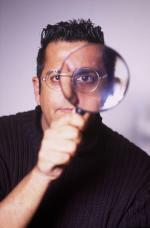 Simon Singh: Science and the Media: The Good, The Bad and The Ugly. This years Thackray Lecture (part of the Natural History Museum Students' Conference) was given by Simon Singh, perhaps most famous at the moment for fighting a libel case against the British Chiropractic Association. I prefer to think of some of Singh's other work, including the book and documentary Fermat's Last Theorem and The Code Book (and more recently Trick or Treatment?). There are problems with the relationship between scientists and the media. As a scientist I find sometimes the media make some mistakes with species names, such as incorrectly identifying the world's longest insect, illustrating an article with an insect from a different order, or even getting the biology all wrong. The fact that all of these are recent papers (within a month or so) and on a small order of insects (only 3,000) species doesn't give me much confidence in the rest of science journalism, most of which is in fields where I know little (if any) more than the science-aware public. Singh is something a bit different, a physicist turned broadcaster, author and journalist. The first part of the talk covered his documentary Fermat's last Theorem (watch online here). As well as explaining some interesting techniques he used, there were a few confessions - including the editing of the words said by one mathematician. This caused outrage from a few colleagues, but in all fairness I believe it was a valid alteration. It did not change the meaning (or significance) of what was said, but removed the need for explaining some mathematics that was not important to the story being told. I don't think this in itself was a problem for anyone, but the fact the words were changed without the permission of the orator certainly divided opinion. If the meaning had been changed I too would have felt very uncomfortable, but I believe the change made for a better documentary and did not compromise the mathematics. But it does highlight the fact that in hands less skilled or scrupulous than Singh's people can easily appear to say things that they didn't mean. The latter part of the talk focused on the BCA case, which I believe has been covered quite extensively elsewhere, by people who have followed it more closely. If you play this and get hurt that's normal. You can decrease your chances of getting hurt by not playing. The game is essentially a grown-up version of piggy-in-the-middle, with the aim for most players being to hit the person in the middle of the circle with a frisbee (they must throw it - walking up to the person and hitting them with a frisbee you're holding is just not on). By convention the players forming the circle keep roughly in position, or move around in a way such that the circle keeps approximately the same size throughout play. As a concession to health and safety a hit must be above the knee and below the head. (There is no guarantee that you won't get hit below the knee or on the head.) In order to allow the middle person to fend off attacks, hits on the arm only count between the elbow and shoulder. If you manage to land a successful hit on the middle person you get to nominate another player to take their place. If you are in the middle and manage to hit any other player (subject to the above rules) then they take your place in the middle. To speed the game up you may only hold on to a frisbee for a maximum of three seconds. In order to play you will need frisbees (about 4 if there are six people). It may also be advisable to have a packet of plasters, antiseptic cream and Deep Heat available. Very little has been written about the tactical nuances of this game. One favourite tactic is for the players in the circle to pass the frisbee among themselves, getting the frisbees into a position from which they can launch a simultaneous, multi-directional attack on the middle player. Some people also go for 'stacking' where a small frisbee is held under a larger one and both thrown together at the middle player.